Plus, the snow meant I got out of work early and had extra time to squeeze in a workout and do some meal prep for the week. 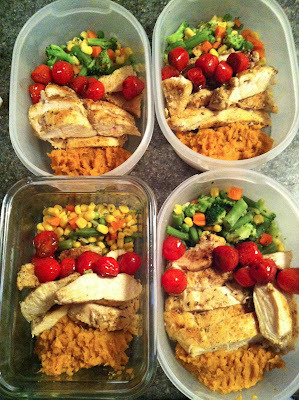 In 30 minutes or so, I made 4 lunches of spiced chicken (recipe here), mashed cinnamon sweet potatoes, mixed veggies, and balsamic cherry tomatoes. Yum. Back to that pork though. As soon as I took a bite (and as soon as I heard Ryan go "OH MY GOD"), I couldn't wait to share the recipe for this Asian pork loin. 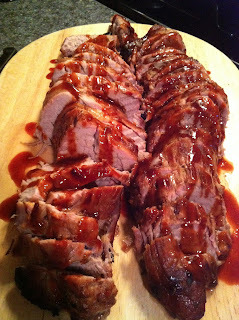 It came out perfectly tender and juicy, and the hoisin glaze is so uniquely flavorful... kind of like an Asian barbecue sauce. This is one that I really hope you try. 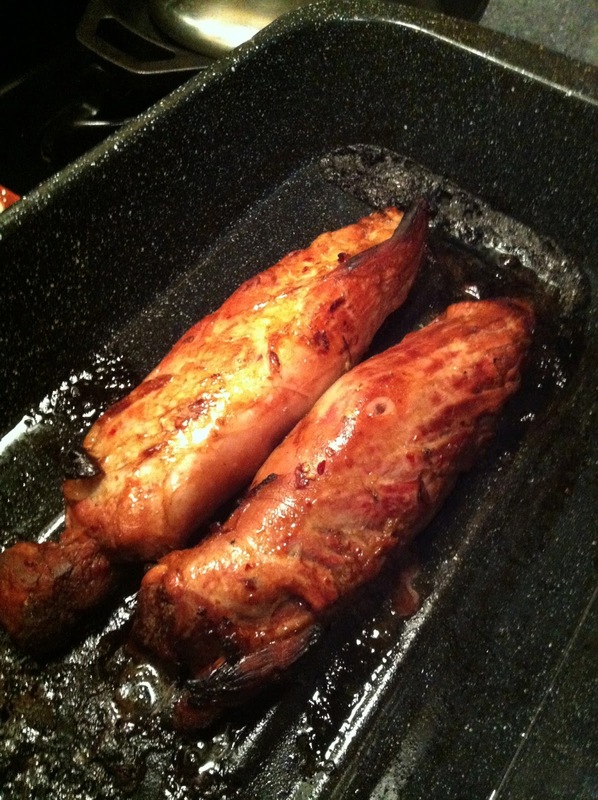 Have you ever made pork tenderloin? I was a little intimidated by it before I made it, but it's really quite easy. Just make sure you account for brining overnight, and have a meat thermometer -- don't want to take guesses with pork! 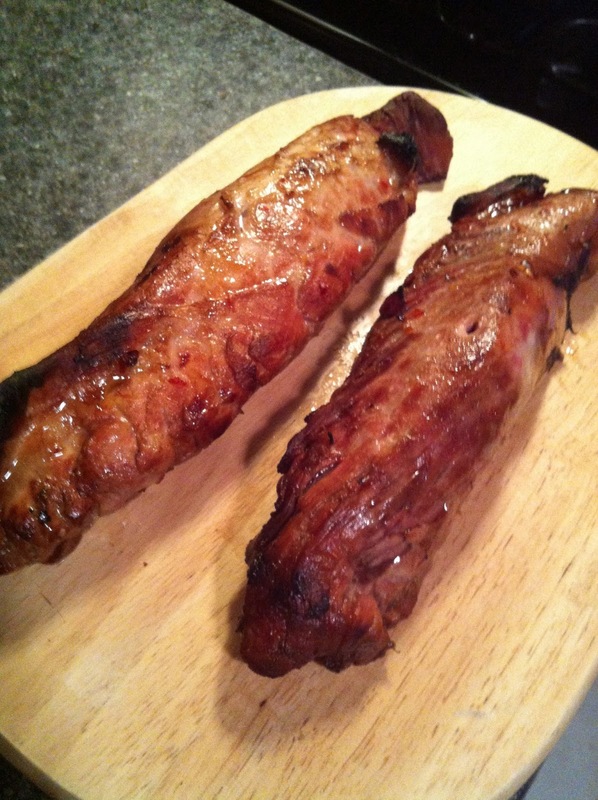 Put the pork in a large ziploc baggie, then fill with: 1 cup mirin (sweet Japanese Sake -- find it in the international aisle), 1 cup water, 1/2 cup soy sauce, a couple tablespoons of sesame oil, a teaspoon of ginger, and a teaspoon of red pepper flakes. 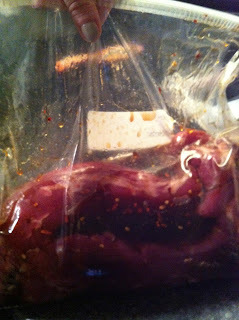 Then just put the baggie in the fridge overnight and let the brine do its thing. When you're ready to cook, preheat the oven to 350 degrees. 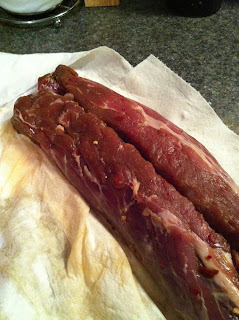 Then, take the pork out of the fridge and drain the liquid from the baggie. 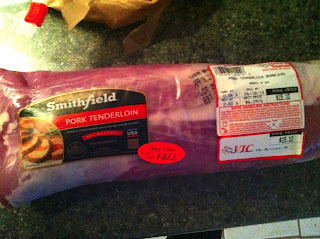 Remove the pork from the bag and dry off with paper towels. The flavors have really seeped in at this point. Place a roasting pan across the stove and spread around a tablespoon of olive oil in it. Turn heat to medium. Add the pork. Cook on all sides until browned -- about 10 minutes. Then, transfer the roasting pan to the oven. 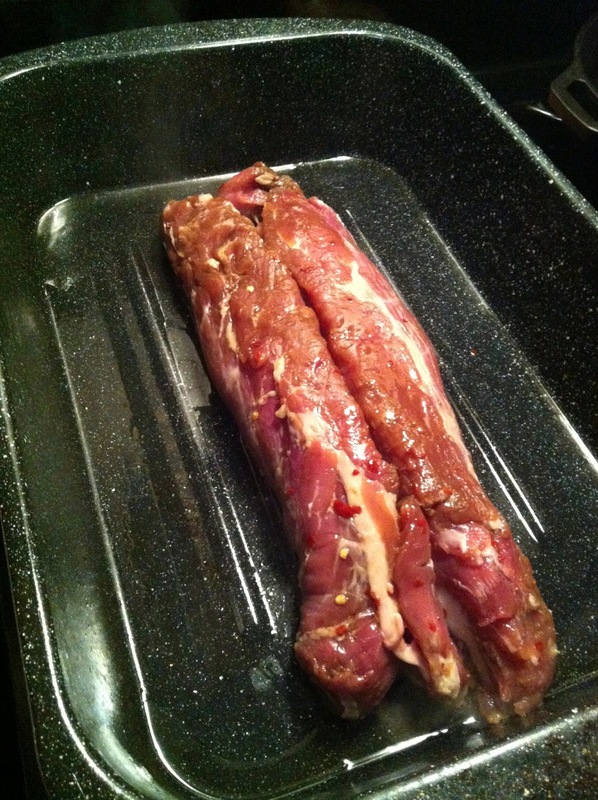 You want to cook the pork until a meat thermometer inserted into the meatiest part reads about 150 degrees. Mine took about 45 minutes. Then, remove from the oven and tent with foil. Let it sit for at least 10-15 minutes, allowing the meat to rest and the temperature to come up a bit more. 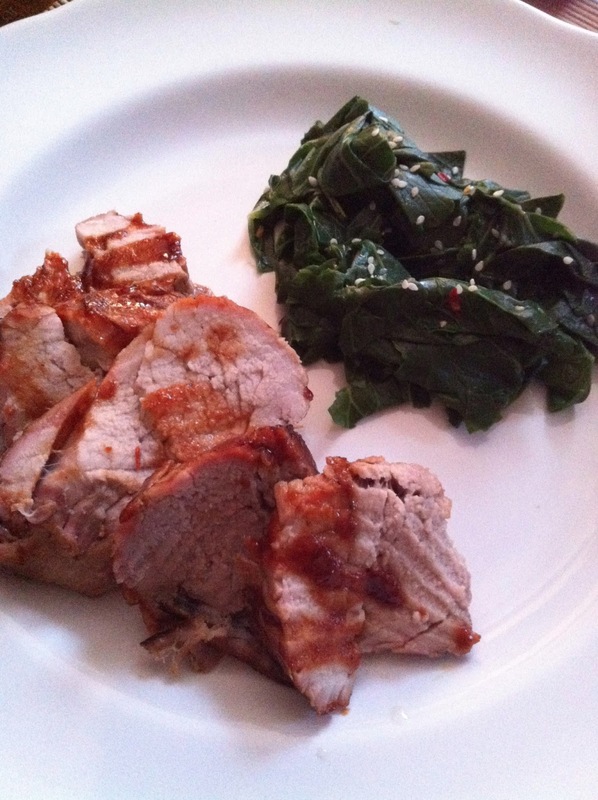 Meanwhile, prepare your Asian-style greens and your hoisin glaze. For the greens, I used this recipe, added a tablespoon or so of sesame seeds, and it was great! 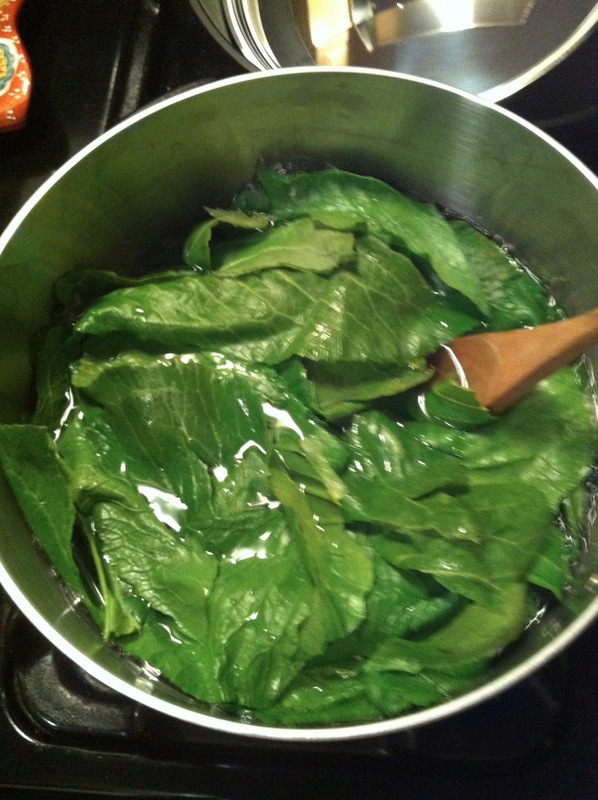 I had turnip greens (which cost a whopping 57 cents for a whole bunch! 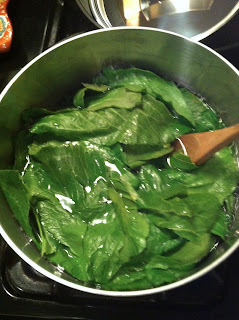 ), but you could also use kale, chard, mustard greens, etc. What a winning combination. 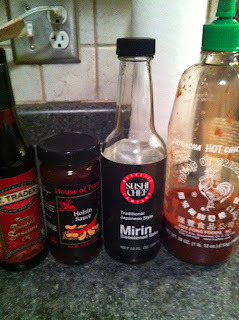 Mix together about 2 tablespoons of the hoisin with 1 tablespoon of mirin, a tablespoon of water, 1 teaspoon of sesame oil, and a teaspoon of sriracha. Mmmm. 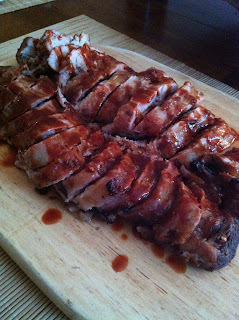 Then, transfer your pork loins to a carving board. Using a long, sharp knife, carve into thin slices. Then, top with the hoisin glaze. So good. So, so good. 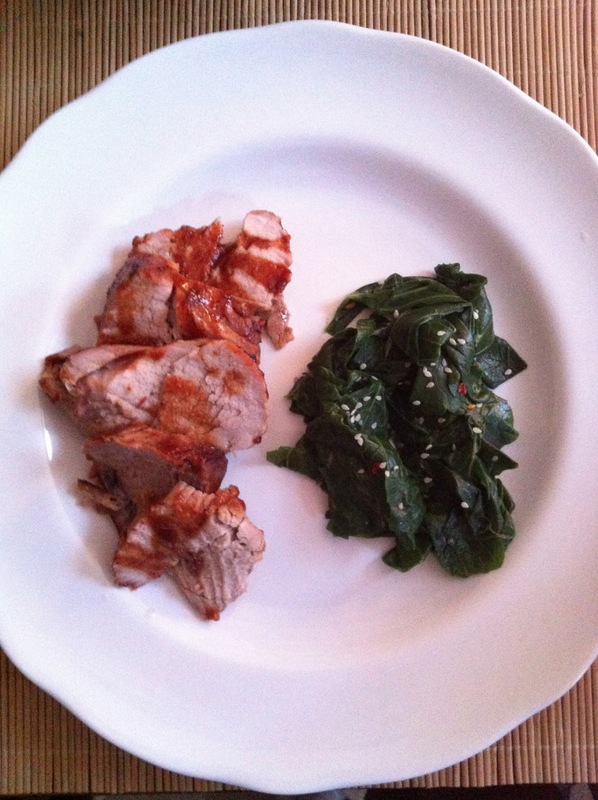 Serve alongside the sesame greens for a super healthy, flavorful, low carb meal. 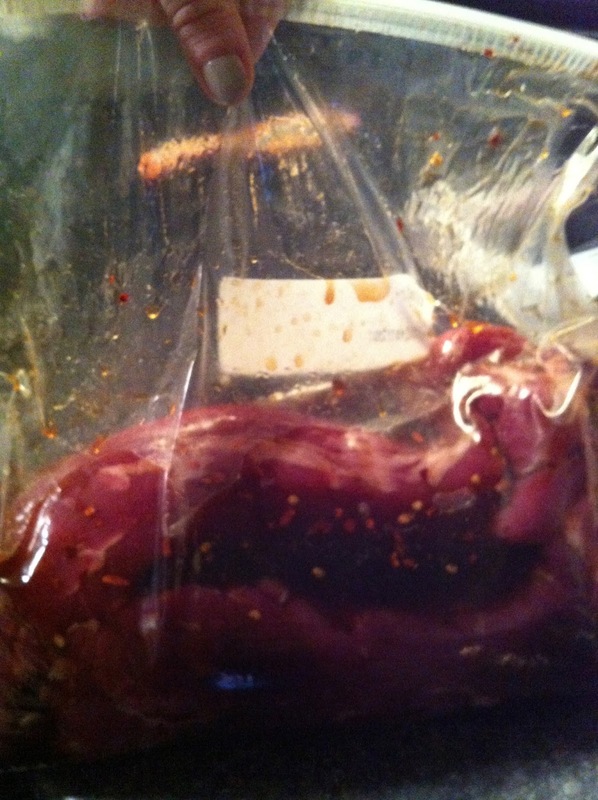 -12-24 hours before cooking: Place pork in a large ziploc baggie and fill with the mirin, water, soy sauce, sesame oil, ginger, and red pepper flakes. Leave in fridge until ready to cook. -When ready to cook: Preheat over to 350 degrees. -Remove pork from fridge. Drain liquid out of bag. 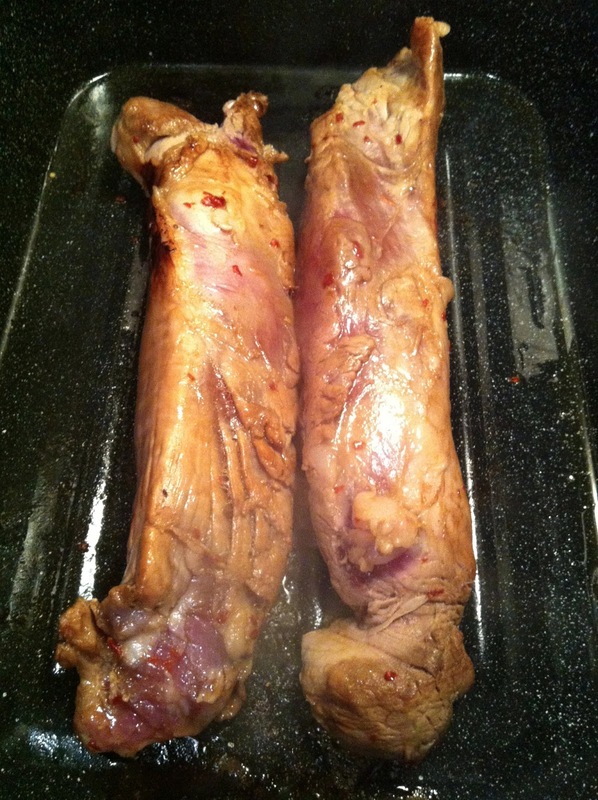 Remove pork and dry off with paper towels. 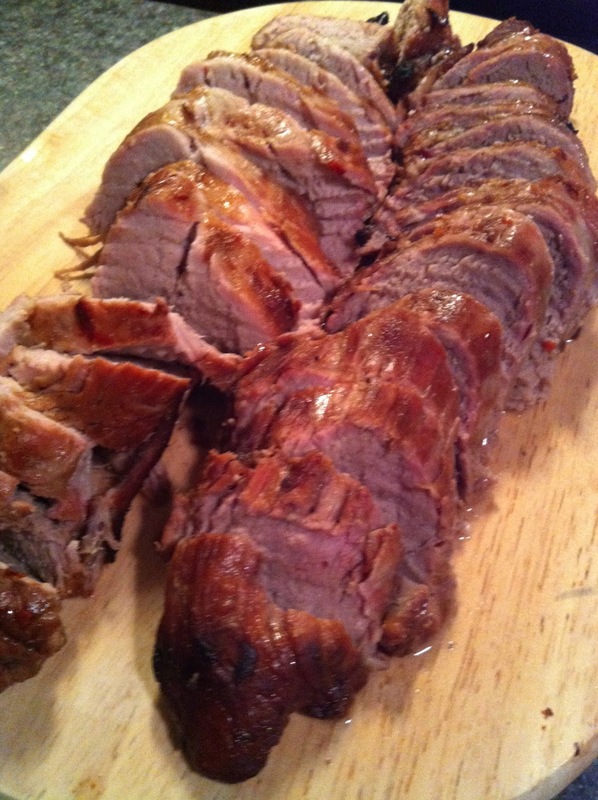 -Place a large roasting pan on the stove and turn heat to medium. Spread 1 tablespoon of oil around pan. 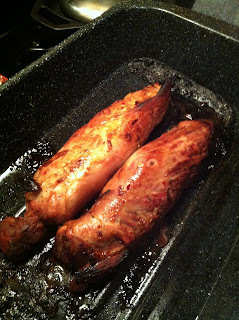 Place pork on pan and cook on all sides until browned, about 10 minutes. 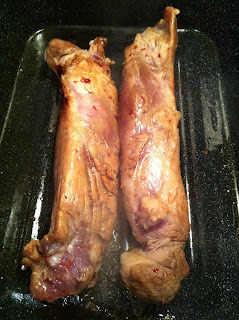 -Transfer pan to oven and cook until a meat thermometer inserted into the thickest part reads about 150 degrees, about 40-60 minutes depending upon size. 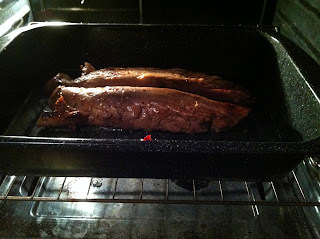 Then, remove from oven and tent with foil for 10-15 minutes. 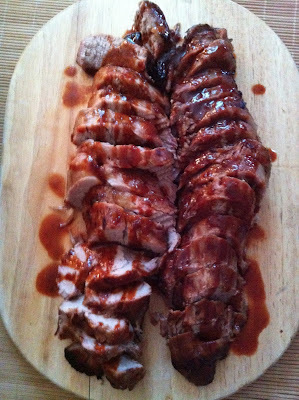 -Transfer pork to a board and carve into thin slices. Drizzle with the hoisin glaze. If desired, serve alongside this recipe for asian-style greens mixed with a tablespoon of sesame seeds. I found Aji-Mirin is this the same as the mirin you have? Yours looks dark but the one I found is clear. Hey Sandie - the mirin I used has a light brown color to it, likely because it's sweetened with a dark sugar. Mirin is naturally light colored or clear but many types that you find at the store are sweetened and therefore may have some color to them. I believe aji-mirin is sweetened too, and I think it should work just fine here! It would be great to find authentic Japanese mirin but you may have to look at an Asian market or even online for it. If yours has more sugar than you want to use, you can replace half of it with rice wine vinegar!